Kristin Janney is a registered dietitian with a passion for helping others make positive lifestyle changes through sound nutrition. She completed her bachelor's and master's degrees in dietetics and community nutrition. Cancer prevention, diabetes management and prevention, weight management, and program planning are amongst her highest interests. Americans consume vast amounts of sugar, with an estimated intake of 180 pounds per person per year. Sugar makes food taste sweeter and last longer, and helps improve texture, but the carbohydrate may not be so sweet for your health. Sugar is a broad term that encompasses many small groups of sweeteners. Glucose, fructose and sucrose are three types of sugar. Sugar comes in many forms. 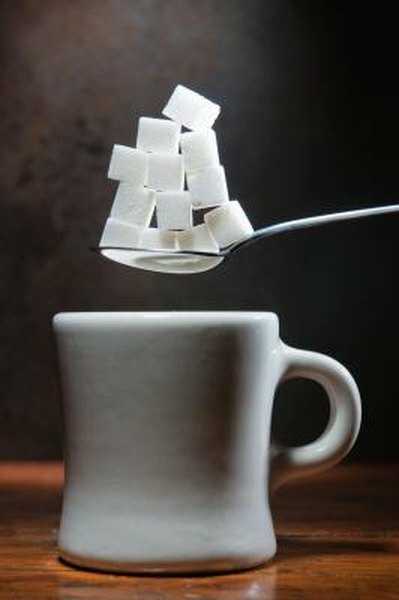 Some sugars come from natural sources such as fruits, vegetables, sugar cane and sugar beets. Sugars can supply many of the calories you eat. A sugar is a carbohydrate and contains 4 calories per gram. Simple sugars, known as monosaccharides, are made of single molecules. Disaccharides are two monosaccharides bonded together. Many sugars we eat are made up of multiple types of basic sugar. For example, an apple contains both fructose and glucose. Glucose, also known as dextrose, is the most common sugar and the type of sugar that your body uses for fuel. It is the sugar measured in your blood during a fasting blood glucose test. This sugar is commonly found in fruits, vegetables and honey and it is a component of corn syrup. Fructose is the natural sugar that sweetens fruits and it is also present in honey and some vegetables. It is most commonly known as a component of high-fructose corn syrup. Fructose, which is the sweetest of all granulated sugars, is about 1.2 times as sweet as table sugar, reports the American Dietetic Association. The ADA also reports fructose is often used to improve texture, taste and stability in many food products. Sucrose is the type of sugar you use in your kitchen and in cooking. It is derived from either sugar cane or sugar beets. There are many different types of sucrose. Raw, turbinado, white, powdered and fruit sugars are some of the varieties. Sucrose is a disaccharide composed of one molecule of fructose and one molecule of glucose, says the Chemistry Encyclopedia. Although sugar tastes sweet, the carbohydrate can be sour to your health. Your body doesn't need sugar to function properly, and when eaten in excess, sugar can contribute to weight gain, elevated triglyceride levels, cavities and insulin resistance. Keep your intake of added sugars, which come from candy, desserts, pastries and even condiments, to a minimum. Most of your sugar intake should come from natural sources, like fruit and milk. American Dietetic Association: Nutrition Fact Sheet-Facts about Fructose.